Welcome to the second Side Hustle Income Report for Money Dot Calm (you can read the first one here). 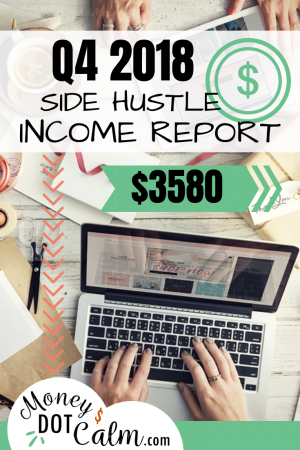 This report is a combination of all the income earned from the fourth quarter (Q4) of 2018 from my side hustle niche blog, Savvy Horsewoman, the Etsy shop and Amazon Merch account. I tried a few new blogging strategies, which I’ll share below, and benefited from the busy shopping season on Etsy (I also had one FAIL!). Whenever I mention my side hustles to friends or followers I get asked a lot of questions. I remember reading about other people’s side incomes and wondering how they do it. This income has been a nice bonus for our family to help build our savings, and also have some “fun money” for activities with the kids (you can read more about our story here). There’s been a lot of work involved, but the long term goals is to have these side hustle projects continue to grow and work as (mostly) passive income while I focus on the Money Dot Calm blog. Seeing my progress (or sometimes lack there of) is a great way to keep myself motivated. This was a great 3 months, but it didn’t come easy! I worked hard to increase traffic by doubling my pinning schedule on Tailwind, updating several old blog posts and writing new content. The winter is typically my slowest season for traffic, so this gave it a much needed boost. I also hosted my first “Guest Blogger Month” where I invited 8 of my favorite fellow bloggers to submit a guest post for November. This resulted in a lot of traffic and social media shares, and introduced my readers to a new group of talented bloggers. It was a win-win, and I’ll definitely try this strategy again. This was my first Christmas with the Shop, and I had seriously underestimated the amount of holiday traffic on Etsy. With very little marketing I had over 100 sales for November and December, so this will definitely be a focus for the next Q4. If you’re thinking about opening your own shop, I use Printful, a print-on-demand service, which automatically integrates with Etsy. This makes it easy to run, without a big time (or money) investment. At a whopping $23 dollars per month of income, this side hustle has been a FAIL for me. Admittedly, it’s also the where I’ve put the least amount of effort, so I can’t blame the system. I know many others are making a FORTUNE through Merch, and I’ve enjoyed the passive income (even if it’s small), but it definitely won’t be my focus going into 2019. This was my best Q4 yet, so going forward into 2019 I’m hoping to keep up the momentum! 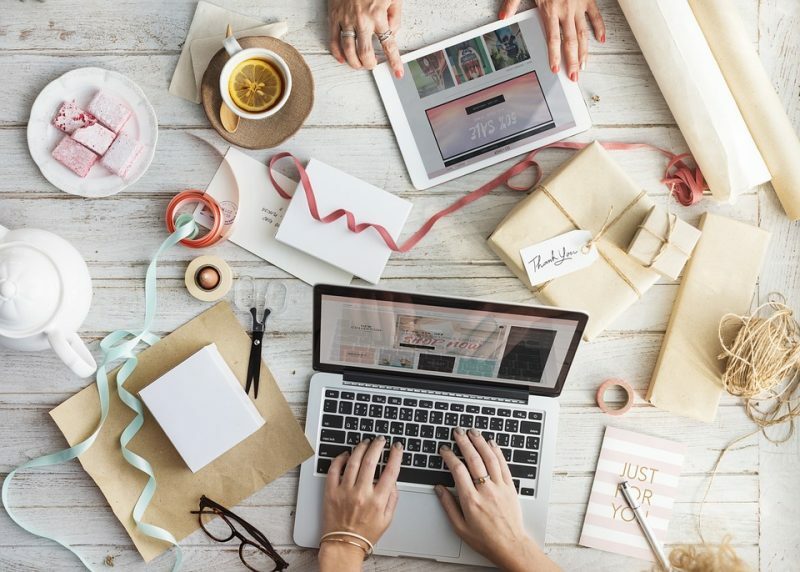 Making Sense of Affiliate Marketing – After taking this course, adding a passive income stream your blog is a piece of cake. Michelle earns over $50,000 a month through affiliate marketing, and she shares all of my best tips in this step-by-step course (it helped me earn an extra $225 this Q4). Get started now. Fiverr – This site is the ultimate time saver. We all have blogging tasks that aren’t our favorite, and Fiverr is the easy solution to out-source those jobs (starting at $5!). Whether I need a designer, programmer or video expert, this is always the first place I stop. Check it out here and get 20% off your first order. How was your Q4? Share you successes in the comments! Hey Kristal, I’m so glad I stumbled across this site!! I’ve been working actively to monetize my blog. While I’m pretty darn tech savvy and have been doing most of the things you mention I LOVE to see another equine bloggers income report. Your reference to Amazon Merch was intriguing for me. I’d never heard of it so I signed up!! I have always had lots of T-Shirt ideas but haven’t branched into making them yet…maybe that is something I need to consider ;D So far I’ve made a whopping $24 bucks over there but that isn’t bad for only one product!